I was going to start this post by saying that it’s been a while since I’ve updated, but I don’t want to turn into one of those bloggers who blogs about how I haven’t been blogging! Life’s been busy, I’m sure you’ve been there. But the weather is warming up, flowers weeds are in full bloom, and Easter is coming. This is one of my favorite times of the year, probably because growing up my birthday was so near Easter. But whether you celebrate or not, the idea of new beginnings is always exciting. And I like lambs and bunnies (who doesn’t?) so there’s that, too. A couple of weeks ago we got some new bulky yarn in the shop called Yearling. It’s a wonderful sturdy blend of wool and cotton and was accompanied by the most adorable booklet of designs by Pamela Wynne. 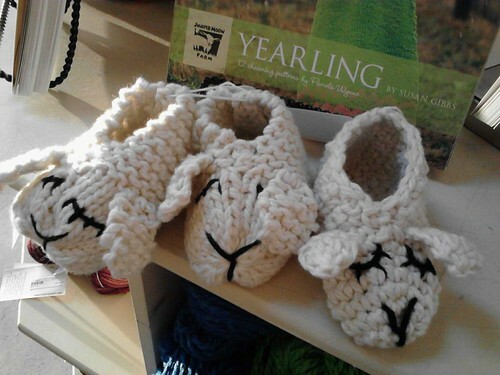 Tammy quickly knit up the Lamb Shoes and I eyed the remainder of the ball and asked if I could crochet a sample with it (we try to always feature both). I was all over the same slipper idea because darn, they are cute!! I whipped up one slipper with 24 grams of the ball, using the basic idea from my Family Of Slippers pattern from Interweave Crochet Accessories 2011. The only change you’ll need to make is to use your own number of stitches per inch as a multiple rather than the one I got with the worsted yarn the pattern uses (the pattern is written formula-style, this will be clear to you if you have the issue). Then I crocheted some simple ears (Chain 6. Row 1: Dc in 3rd dc from hook and each chain across–4 dc. Row 2: Ch 2, sk first st, dc3tog. Fasten off), stitched them on and embroidered the face. Voila. Now we have three happy lambs lounging in a row. I love ‘em. Almost enough to get some more yarn and make an adult sized pair for myself! I’m also teaching an awesome 11-year-old how to crochet amigurimi and we are using this cute bunny pattern from Lion Brand. I usually don’t crochet during lessons (I want to pay attention to the student) but she asked me what color my bunny was going to be and….yeah, I had to make a bunny too. Next week, we sew it all together and embroider the nose. I must say, amigurimi are amazingly quick and fun to work! This won’t be my last. Here’s my Ravelry page for the project, and in case you were wondering, the eyes are from 6060 on Etsy. We also have a ton of new eyes in store at Yarnivore. I also cranked out another Circles Scarf, this time in a new color of Knit Picks Chroma called Azalea. Love it, and I can wear it with all of my Tangerine Tango colored tops. They say it’s the color of the year, you know! The pattern is available on Craftsy and Ravelry. And while I’ve got you here, don’t miss this great giveaway of 26 books on Ravelry. Twenty-five Ravelers will win all 26 books (each!) and among them is my book, Little Crochet. All you have to do to enter is take their free, 5 minute guided tour of the new library functions. It’s pretty cool, if you set up your library by adding books and mags that you have, you can do pattern searches just within the patterns you already own. And, broken record time–if you’re not on Ravelry yet? WHY NOT? That’s all that’s new around these parts. What are you working on? Let me know in the comments. I totally understand. Luckily, it's not the warmest thing ever, especially if you make it from cotton or sugar cane, etc. But there's always next year! It depends on the student, and many of mine have a ton of questions that they've waited forever to answer. But also, a lot of them would compare themselves to me, and think they were too slow or that it would never be as easy as I made it look. No matter how many times I mention that I have years worth of practice, people still think that they are supposed to instantly know how to perform a completely new skill. I have learned so much about adults and how they learn, and I'm sure everyone has their own method that works for them. Love the post, Linda! 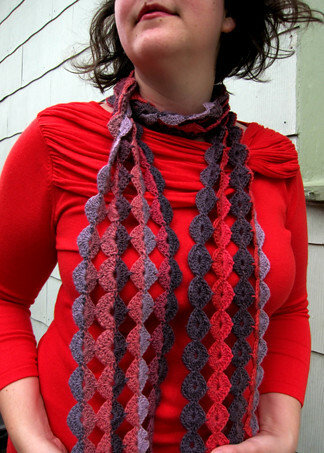 I am inspired to stitch up the circles scarf! Thanks Cami. It's super fun with color changing yarn...I almost want to make another one!